The Hunter comes to Los Angeles. Returning to Los Angeles in support of their latest LP, CoS-approved The Hunter, Atlanta prog metal mammoths Mastodon brought down the house at the Wiltern Tuesday night. Freed from the fetters of having to focus on any of the several concept albums they’ve spent most of their career touring, Mastodon finally find themselves at the point in their career when they can play a comprehensive set that touches on all the best points of their catalog. Few metal bands make it this far into a career, and even fewer could top the bill at a venue like the Wiltern. 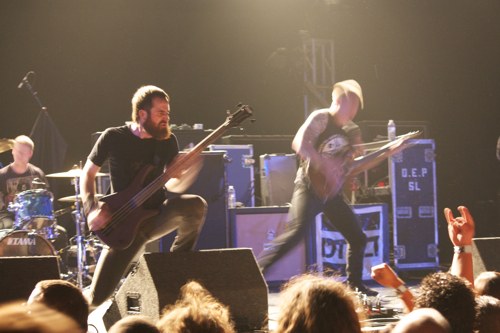 Support came in the form of sludge rockers Red Fang, who were followed up by Dillinger Escape Plan. In just over a half hour, Dillinger blazed through choice cuts off their four records, favoring 2010’s Option Paralysis as they assaulted the crowd with their blistering technicality. Frontman Greg Puciato engaged in his usual antics, providing apt visual accompaniment by both leaping down into the crowd several times to scream out his lyrics from the center of one of several circle pits going and scaling the stack of monitors to the left of the stage, crouching atop them as he egged said circle pits on. The band were on point, too, ceaselessly thrashing about from the instant they started playing till the chaotic finish of set closer/fan favorite “Sunshine the Werewolf”. 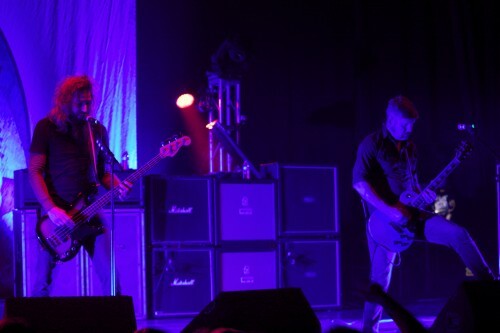 Mastodon kicked their set off with the one-two punch of “Dry Bone Valley” and “Black Tongue”, two highlights off their most recent record, before breaking into “Crystal Skull” off their acclaimed Blood Mountain. In the arena of music, especially live music and even more specifically, live metal music, it’s said almost too often how one act or another make their craft look too easy. 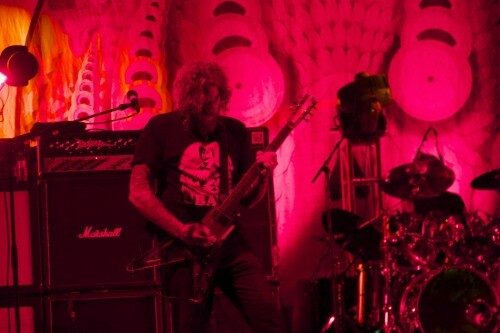 Mastodon, a band whose every song contains no less than two or three of the most ridiculously technical solo bits imaginable, blazed through their set almost nonchalantly. Drummer Brann Dailor, for one, absolutely destroyed his drum kit on “Caprillian Crest”, hammering away at some baffling, off-time tempo with an ear-to-ear grin on his face. Few bands this technical pay half a mind to songcraft either, making it all the more impressive when they brought it all home with a smashing chorus, as on “Sleeping Giant” and “All the Heavy Lifting”. The latter, easily the brightest spot on this year’s The Hunter and truly one of the best songs in their entire catalog, inspired a full-on crowd sing-along each time Troy Sanders and Brett Hinds came in with that larger-than-life chorus. The band has relished the spotlight they’ve been afforded as of late: They spent most of the Blood Mountain and Crack the Skye tours opening for everyone from Metallica to Alice in Chains/Deftones to Cartoon Network’s resident metal band Dethklok, their colossal jams about wormholes, Joseph Merrick, and Rasputin often falling on crossed arms and indifferent ears. Even when they did headline shows on the Crack the Skye tour, they often seemed constricted by the record’s confines, playing it in its entirety before a short encore. Here they were much more comfortable as they jumped back and forth through their discography, playing tracks off each of their five albums. Indeed, The Hunter is a stellar effort. 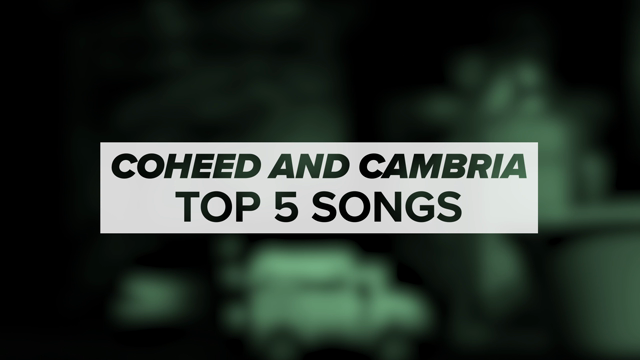 It highlights the band’s ability to craft not just a great album, but great songs, too.